Two rainfall warnings were issued yesterday and it now looks like the rain is set to stay for the coming days. AFTER HEAVY DOWNPOURS overnight, the weekend isn’t looking much drier with showers and outbreaks of rain forecast for the days ahead. Following a period of drought that led to Met Éireann issuing warnings for a lack of rain less than 10 days ago, two rainfall warnings were issued yesterday. It now looks like the rain is set to stay for the coming days. Met Éireann says it will be mostly cloudy this morning with outbreaks of rain but there will be sunshine for a time before more scattered showers arrive. Rain will continue in northern counties for much of the day with highest temperatures of 14 to 18 degrees. Tonight will start off mainly dry but rain will develop along the south coast towards midnight and will spread over much of Munster and Leinster overnight. The rain is expected to clear tomorrow morning and it will be bright with sunny spells. But it won’t last for long as showers or longer spells of rain will develop in the afternoon and will spread to all areas in the evening. Email “Wet weekend ahead with plenty of showers forecast among sunny spells ”. 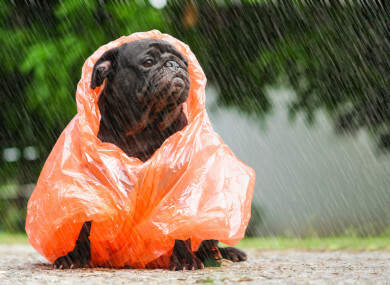 Feedback on “Wet weekend ahead with plenty of showers forecast among sunny spells ”.